Hi Guess The Games Answers - We have all the Hi Guess The Games Answers and cheats for every level in the game. This game is all about identifying cool drawings of icons and characters from your favorite mobile game apps. Use the letters to spell out the names of your favorite iPhone, iPod, iPad and Android games. If you get stuck and need some quick help, just find the level that you hung up on on this site and you'll find the answer too. Hi Guess The Games is all about games. Mobile games. iOS (iPhone iPod and iPad) and Android games. Look at the icon or character and try to figure out what game it's from. There are hundreds of levels to test to see if you are a true gamer. 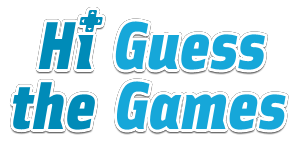 If you need help, Hi Guess The Games Answers is here to provide you with solutions and cheats for all levels. Hi Guess The Games Answers | Hi Guess The Games Cheats This site is not endorsed by or affiliated with CamMax.